Years ago I wrote about Monet’s Palate, a charming film narrated by Meryl Streep. It delves into the life of Monet at his home in Giverny. Monet’s passions were painting and gardening, but he also clearly enjoyed the pleasures of the table—eating, drinking and entertaining guests. A new book, Monet’s Palate Cookbook is less about historical and sometimes antiquated and inaccurate recipes left behind by his cook, and more about his life in Giverny. It covers his approach to gardening, eating and entertaining with plenty of recipes of course. The book begins with his passion for good food, then moves seamlessly into his kitchen garden and many of the fruits and vegetables that were grown at the time, as well as the specific ones that were grown in his garden and details about how they were propagated. But the majority of the book is dedicated to recipes. The recipes are inspired by Monet’s kitchen garden at Giverny, but fresh and modern. Some of them refer to favorite dishes served to artists of the day—like bouillabaise for Renoir and others are from places he traveled to such as the Yorkshire Pudding from the Savoy Hotel in London. Finally there are recipes from famous chefs like Michel Richard and Anne Willan, inspired by his kitchen notebooks. 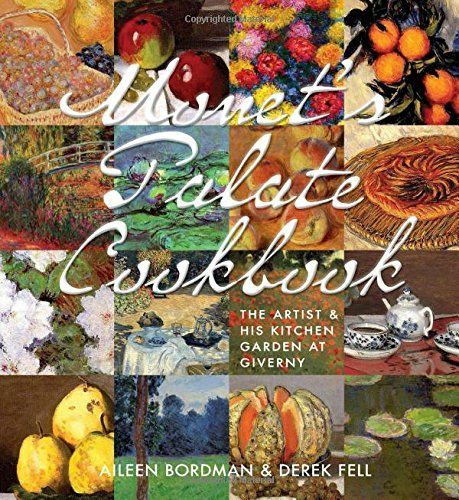 The recipes include notes about their connection to Monet, and bits of trivia that Monet fans are sure to relish such as the fact that he brought back seeds for zucchini from Italy or that he imported bananas for ice cream to be served on Christmas. Recipes I’ve bookmarked include Roasted Cod with Fresh Corn, Red Peppers, Onion and Caper Salad, Roast Pork with Cherry Sauce, and Mocha Layer Cake. The book like the film extends the experience of visiting Monet’s home in Giverny. If you’ve been there it’s something you won’t likely forget and if you haven’t, it should be on your bucket list. Disclaimer: I received this book as a review copy, this page includes an affiliate link. I was not paid to compensated monetarily to write this or any other post.